We are so excited to have a vegan dessert recipe from Chef Hilary Zozula! She has shared her recipe for raw, vegan, gluten-free chocolate brownies!!! They only take about 30 minutes to prepare and an hour to firm up in the fridge… and they are worth every second of the wait! Co-owner of Eden in Shadyside, Chef Hilary has created many super yummy raw vegan dishes for her restaurant. 1. Combine all the brownie ingredients EXCEPT the agave, vanilla and bananas in your food processor. Process until you have a powder. Transfer the powder to a mixing bowl. 2. Either use a food processor, a blender or a Vita-Mix to process the bananas, agave, vanilla and water. The end result should be a slightly runny mixture. 3. Mix the banana/ agave mixture into the brownie powder. The texture should be similar to that of fudge. If the mixture is too wet, add a few more oats. 4. Spread the mixture into an 8 x 8 baking pan and chill in the refrigerator for at least one hour to allow the mixture to set. The longer the mixture sets, the drier and more "brownie-like" they will become. Overnight is even better. 5. Combine all of the sauce ingredients in your food processor and process until smooth. Store sauce in the refrigerator until it's time to serve the dish. 6. Cut brownies and plate individually. Top with the strawberry acai sauce and a fresh stawberry. Enjoy the rich cacao deliciousness! 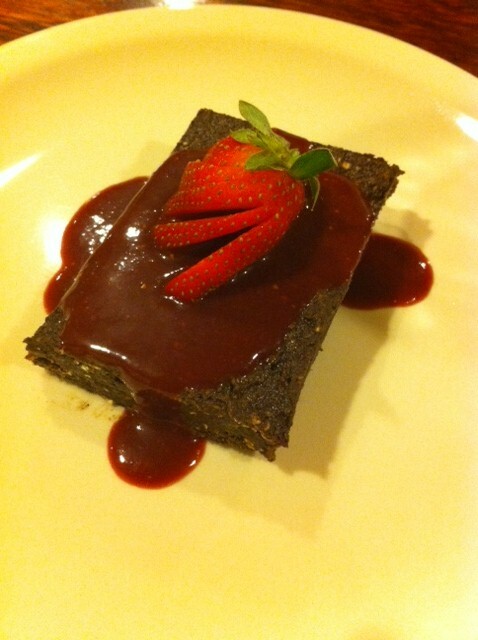 Let us know what you think of this easy vegan recipe: Raw Chocolate Brownies with Strawberry Acai Sauce! I have eaten these wonderful raw chocolate brownies and they are absolutely delicious and satisfying.